When: Usually first Saturday of the month, January thru June. Dates for 2019: Jan 5, Feb 2, Mar 2, Apr 6, May 4, Jun 1. Where: Ottawa Sportsmen's Club, Highway M-38 six miles west of Baraga, Michigan (Link to Ottawa Club web site). Time: Registration 10:30 AM (Eastern time zone). Shooting begins at 11:00 AM. Fees: $3 to shoot and another $3 for lunch. 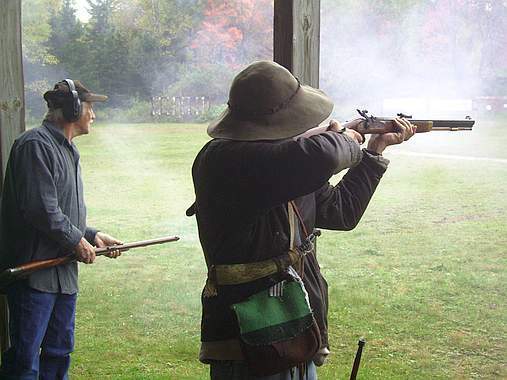 Firearms: Any traditional muzzle loader, sidehammer or underhammer, flint lock or percussion cap lock, rifled or smoothbored, having open sights, and using patched round lead balls. Peep and optical sights are generally not permissible. Contact organizer (see below) with any questions about what may be acceptable. Course of fire: Usually about 16-20 shots total. Targets normally include metal silhouette and novelty targets from 5 to 100 yards, and three or four paper targets with one or two shots each. An offhand unsupported position is required for most shots, with some exceptions for juniors under 12 years of age and for handicapped shooters. At some shoots for some targets, two- or three-person teams may be selected semi-randomly from the shooters that are present. Awards: Place Ribbons are given for success on the paper targets and sometimes are awarded for the other targets. Range Facilities: An outdoor covered range helps to keep some of the snow or rain off the shooters. An indoor range may provide some warmth on very cold days and is used when shooting at some of the paper targets. Lunch: Lunch is provided by different volunteer members every month. FUN: Guaranteed. Friendship provided at no additional charge. Sponsorship: The UPMLA sponsors the shoots held in February, and May. The Ottawa Sportsmen's Club and the UPMLA co-sponsor the shoots of January, March, April, and June.